The sentence refers to thousands of farm animals that had grazed outdoors during the days of the most powerful releases of radioactive isotopes from the burning Chernobyl reactor. These animals were deemed too contaminated to save. Some were marked by radiation burns and some already exhibited signs of weakness. The criminal part is that these animals were not sacrificed and placed in sealed mass graves. Instead Soviet officials had decided to process the meat, most likely into sausage… and release the product into the Soviet consumer market. A document from Kate Brown’s archival research in Kyiv. The document shows how the MAGATE (IAEA) norms start to be introduced in 1989 for maximum lifetime dose of radiation (measured in bers). Photograph by Kate Brown. Unfortunately, the meat factories were not the last stop for the polluted carcasses. A first shipment of seven hundred hides, four tons of organic matter, were sent in July and August to the Berdichev leather factory to process into shoe bottoms. This narrative line of the Chernobyl accident is well known. Thoughtless, mendacious Soviet leaders hid the accident, dissimulated and carried on as if everything was normal in a way that showed an outsized disregard for the health and welfare of the Soviet population. It is fair to say that a portion of the Soviet top leadership, especially the cadres working from the Moscow capital, maintained the posture of “no problem/everything is under control,” a stance that coincided seamlessly with the aspirations of international leaders such as Hans Blix at the International Atomic Energy Agency. Chernobyl offered up for Soviet leaders an opportunity for genuine collaboration with the West at the very start of perestroika. This early collaboration centered on the minimization of Chernobyl as a technological disaster. But ‘Soviet officialdom’ was not all of a piece. The archives of the Soviet-era Ukrainian Ministry of Health are filled with dramas that played out across traumatized, post-disaster Ukraine. In the dramas, there are villains, and there are heroes. The hero of the leather factory is the Berdichev sanitation inspector who wrote the criminal-sounding sentence I quoted above. In the dramas, there are villains, and there are heroes. The hero of the leather factory is the Berdichev sanitation inspector who wrote the criminal-sounding sentence I quoted above. Directing his telephone-gram to his superiors in Kiev, P. I. Chekrenev related that in June a delegation from the Ministry of Light Industry arrived at the Berdichev leather factory. (These are the villains, or maybe not villains, but merely optimists). The businessmen said they wanted to carry out an experimental processing of contaminated hides to see if they could dis-activate them for use on the consumer market as shoe bottoms. The process called for extra hours of rinsing and boiling the hides, as well as for treatment in vats of chromium. They signed an agreement and shipped in the hides, each one measuring from .3 to 1 millirad/hr. That measurement meant that individually each hide was safe, but the numbers multiplied several hundred times were a cause for concern. And that concern stimulated Chekrenev into action. He and a doctor on staff at the sanitation bureau dug up some dosimetry equipment and went to the leather factory and took their own measurements. They evidently returned repeatedly, assessing anxiously and vigilantly, because on July 25th they recorded that the radiation level of the factory’s wastewater registered from 1.3 to 6.5 times higher than permissible levels. Worse, the factory’s waste flowed untreated directly into a local river. Seventeen-thousand cubic meters of chromium-laced and radioactive water waste quickly overflowed the small Gnidopiat’ River and poured into a reservoir that served as the main water source for the city of Zhitomir. 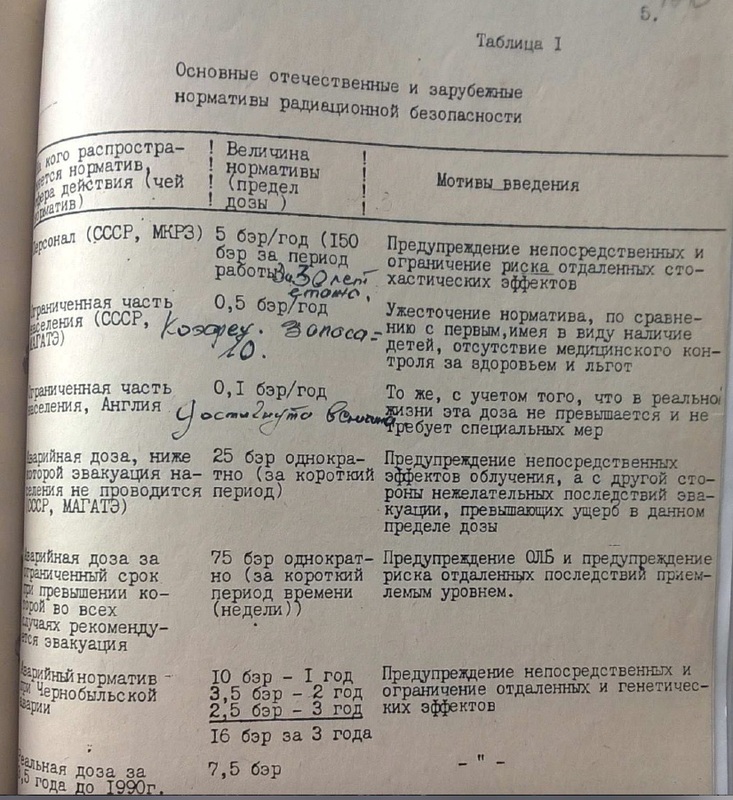 “There is no way,” Chekrenev wrote in exasperation, “that long-lasting radioactive isotopes can be drained into a drinking water reservoir.” Without waiting for approval from his superiors at the Ministry of Health in Kiev, Chekrenev signed an order, citing a Soviet pollution law from 1980, and he shut down the processing and shipping of contaminated hides to the Berdichev leather factory. The officials from the Ministry of Light Industry were fit to be tied. They had found their leather-processing experiment a success. The leather produced was clean enough for shoe bottoms, and they had counted up the shoe bottoms they expected to produce from the unexpected boon of 17,000 extra animal carcasses brought to them free of charge by the Chernobyl disaster. Chekrenev, however, disturbed their calculations by pointing to the fact that radioactive isotopes cannot be “dis-activated.” That is one of those optimistic terms to be placed in the same aspirational vocabulary with “liquidation” and “permissible dose.” Radioactive isotopes can only be moved from one place to another, while they decay on their own schedule. The cleaner the leather emerged from the factory, the dirtier the wastewater that flowed from its drainage pipes along the riverbank. Or, to put it another way, exposures saved at the bottom of citizens’ feet flowed instead into city pipes to be dropped directly onto citizens’ skins and into their mouths. To put it another way, exposures saved at the bottom of citizens’ feet flowed instead into city pipes to be dropped directly onto citizens’ skins and into their mouths. Under pressure brought on by a landslide of classified correspondence from the Ministries of Light Industry, Leather Products and Industrial Agriculture, Chekrenev did not yield. His bosses at the Ministry of Health in Kiev backed him up, and the dispute went all the way to the Council of Ministers of the Ukrainian Republic. That body supported Chekrenev’s principled and lone-wolf decision to terminate the processing of contaminated hides at the Berdichev leather factory and so save the people of Zhitomir from additional exposures, of which, by September 1986, they already had plenty. The infamous monolithic Soviet state is nowhere to be found in this story. Chekrenev acted on his own, taking a risk in this year before the liberalizations of the glasnost era. Yet it wasn’t a risk. In the correspondence, Chekrenev was not threatened or cursed. No one called for his arrest or resignation. Instead, this small chapter of Chernobyl history includes easily recognizable players in societal dramas. There were the people looking to make their quotas and turn a profit, and the people looking to protect public welfare. As the 30th anniversary of the Chernobyl accident approaches, it is important to normalize late Soviet history so as to place the disaster inside the boundaries of normally functioning states. This is not the story of a special, spectacularly incompetent and unsympathetic state, but one that functioned much like capitalist states elsewhere did at the time. As I work my way through archives in Kiev, I am learning that Chernobyl was, in far too many ways, sadly typical. (1) The files for this case are in the archives of the Ministry of Health of the Ukrainian Republic at the Central State Archives of the Higher Organs (TsDAVO), Kiev, Ukraine, 342/17/4348. (2) “VCh-gramma no 129 ot 23.06.86 g. iz Minsdrava SSSR,” June 23, 1986, TsDAVO 342/17/4340, 162.r too many ways, sadly typical. Professor Kate Brown has written a number of publications relating to Toxicity, including the multi award-winning book Plutopia: Nuclear Families in Atomic Cities and the Great Soviet and American Plutonium (Oxford University Press) and her latest book Dispatches from Dystopia: Histories of Places Not Yet Forgotten (University of Chicago Press). For more information about the historian and author Professor Kate Brown, please click here.